(TORONTO) – Moments of exhilaration are plentiful when Canadian drivers slip behind the wheel of the 2009 Lexus ISseries luxury sport sedan. With a choice of rear wheel or all wheel drive… 2.5litre or 3.5litre engine displacements… and six-speed transmissions in manual or automatic configurations… plus the state of the art Lexus Vehicle Dynamics Integrated Management (VDIM) system as standard equipment on all models… the ISseries puts the focus squarely on performance and handling. Moreover, the 2009 IS series carries a new starting Manufacturer’s Suggested Retail Price (MSRP) of $33,050. For 2009, the ISseries is offered in four models to ensure Canadians passionate about performance can find the luxury sport sedan that’s perfect for their driving style. Regardless of model, each is equipped with a generous suite of performance, handling, safety, comfort and convenience features. New, distinctive grilles and integrated turn signal lamps make the 2009 model year instantly recognizable, while all 2009 models come fitted with VDIM, Vehicle Stability Control, Traction Control and a comprehensive team of braking technologies to ensure the thrill-inducing performance promised at rest is a reality in motion. What’s more, a plethora of upgrade packages allow Lexus guests to make their ISseries luxury sport sedan distinct. 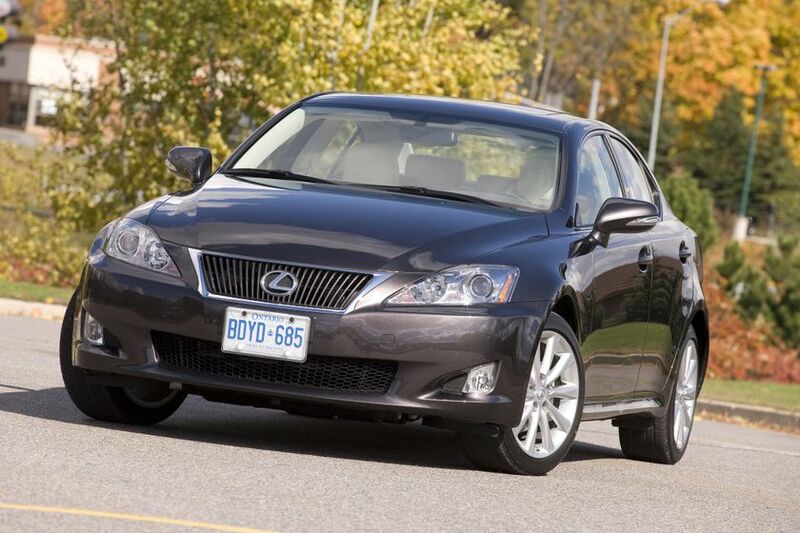 The 2009 Lexus ISseries is now on sale across Canada. The suggested retail price starts at $33,050 for the IS250 RWD with six-speed close-ratio manual transmission and $34,650 for the IS250 RWD with six-speed automatic transmission. The sure-footed Lexus IS250 AWD starts at a suggested $39,200, while the outstanding performance of the IS350 RWD can be enjoyed starting at a manufacturer’s suggested price of $44,550. The Lexus ISseries luxury sport sedans are all about performance to thrill. From powerful engines and highly responsive transmissions, to well-crafted suspension and steering systems and the state of the art Lexus Vehicle Dynamics Integrated Management (VDIM) system – now fitted to all models as standard – the ISseries is a street machine that delivers a pounding-behind-the-ribcage, deep-in-the-gut, sensational driving experience. It starts with a choice of two performance-tuned V6 engines, in 2.5 litre and 3.5 litre displacements. These are mated to six-speed transmissions in two configurations – close-speed manual or sequential multimode automatic with paddle shifters – and a choice of rear wheel drive or all wheel drive configurations. This lets Canadians pick their perfect passionate performance machine. While performance dictates the engineering behind all IS models, the ISseries engines and transmissions are also remarkably fuel-efficient and deliver superb emissions ratings. Toss the ISseries into a corner or accelerate on an uneven surface and the sport sedan’s big performance technologies come into place to keep the IS moving solidly on target. The state of the art Lexus Vehicle Dynamics Integrated Management (VDIM) system is standard fitted to all IS models, and backstopped by Vehicle Stability Control (VSC) and Traction Control (TRAC) technologies. Those looking for maximum control in all weather can opt for the IS250 all wheel drive edition. Engine speed-sensing progressive power-assisted rack and pinion steering works in concert with a specially designed anti-dive and anti-squat independent double-wishbone front suspension featuring gas shocks, coil springs and stabilizer bar to place the IS exactly where the driver desires. The rear multi-link control arm suspension with gas shocks, coil springs and stabilizer bar helps transfer maximum power to the road. The 2009 Lexus ISseries seats five adults in comfort and style. But it also incorporates many active and passive safety systems to help protect them. In addition to VDIM, VSC, TRAC and other active handling and control design decisions, the IS features a tire-pressure monitoring system and a generous suite of braking systems. These include power assisted front ventilated disc and rear disc brakes, enhanced with the Lexus Antilock Braking System (ABS), Brake Assist (BA) and Electronic Brake Force Distribution (EBD) as standard equipment. The more powerful IS350 RWD benefits from ventilated discs at all four corners. Inside the ISseries luxury sport sedans, standard safety systems include driver and front passenger airbags and knee airbags, front seat mounted side airbags, and front and rear head/side curtain airbags. Three-point lap and shoulder seatbelts are fitted in all five passenger positions, and include adjustable “B” pillar shoulder belt anchors plus front and rear seatbelt pre-tensioners and force limiters. Younger passengers are protected with anchor points for child restraint seats and child protector rear door locks. And because safety is important even when an ISseries luxury sport sedan is parked, all models are also equipped with an anti-theft system and a first aid kit. Buyers may personalize their 2009 Lexus ISseries luxury sport sedan on the Lexus of Canada web site (www.lexus.ca) or by visiting any Lexus Dealer across Canada. Buyers of any 2009 Lexus ISseries luxury sport sedan enjoy the peace of mind that comes with the industry-leading Lexus comprehensive warranty that covers the entire vehicle for four years/80,000 kilometres. Power train components are covered for six years/110,000 kilometres, major emission control components are covered for eight years/130,000 kilometres and corrosion perforation for six years with unlimited distance. Service adjustments - minor repairs not usually associated with the replacement of parts - are fully covered for one year/32,000 kilometres, while Lexus owners also enjoy the Tire Road Hazard Protection warranty and access to alternate transportation. The purchase of a new IS250 or IS350 also includes free membership in Club Lexus, an online convenience service that places important vehicle ownership information at the guest’s fingertips. Includes: P225/45R17 (front) + P245/45R17 (rear) all season tires on 17” aluminum alloy wheels; 10-way power adjustable driver and front passenger seats; Leather seat surfaces; Heated front driver and passenger seats. Includes: P225/45R17 (front) + P245/45R17 (rear) all season tires on 17” aluminum alloy wheels; 10-way power adjustable driver and front passenger seats; Heated driver and front passenger seats; Leather seat surfaces; Power moon roof. Includes: P225/40R18 (front) + P255/40R18 (rear) all season tires on 18” aluminum alloy wheels; 10-way power adjustable driver and front passenger seats; Heated driver and front passenger seats; Leather seat surfaces; Power moon roof; Bi-Xenon high intensity discharge (HID) headlamps; Lexus Adaptive Front Lighting System. Includes: P225/40R18 (front) + P255/40R18 (rear) all season tires on 18” aluminum alloy wheels; Sport tuned front and rear suspensions; Power tilting/telescoping steering column; 10-way power adjustable driver and front passenger seats; Heated driver and front passenger seats with ventilation fans; Premium leather seat surfaces; Lexus driver and front passenger seat memory systems with three memory settings for each; Power moon roof; Bi-Xenon high intensity discharge (HID) headlamps; Adaptive Front Lighting System; Electrochromic side view mirrors; Rain-sensing wipers; Stainless steel scuff plates; Aluminum sport pedals with rubber inserts; 1 wallet-sized Smart Card key. Includes: 10-way power adjustable front passenger seat; Heated driver and front passenger seats; Leather seat surfaces; Power moon roof. Includes: 10-way power adjustable front passenger seat; Heated driver and front passenger seats; Leather seat surfaces; Power moon roof; DVD-based navigation system with back-up camera, Bluetooth capability. Includes: Power tilting/telescoping steering column; Bluetooth capability; 10-way power adjustable front passenger seat; Heated driver and front passenger seats with ventilation fans; Premium leather seat surfaces; Lexus driver and front passenger seat memory systems with three memory settings for each; Power moon roof; DVD-based navigation system with back-up camera; Bi-Xenon high intensity discharge (HID) headlamps; Adaptive Front Lighting System; Headlamp washers; Electrochromic side view mirrors; Rain-sensing wipers; Front illuminated “Lexus” scuff plates; Woodgrain trim; Power rear window sunshade; 1 wallet-sized Smart Card key. Includes: Limited slip differential; Power tilting/telescoping steering column; Sport tuned front and rear suspensions; P225/40R18 (front) + P255/40R18 (rear) all season radials on 18” aluminum alloy wheels; Heated driver and front passenger seats with ventilation fans; Premium leather seat surfaces; Lexus driver and front passenger seat memory systems with three memory settings for each; Power moon roof; Bi-Xenon high intensity discharge (HID) headlamps; Lexus Adaptive Front Lighting System; Headlamp washers; Electrochromic side view mirrors; Rain-sensing wipers; Aluminum sport pedals with rubber inserts; Chrome scuff plates. Includes: Limited slip differential; Power tilting/telescoping steering column; Sport tuned front and rear suspensions; P225/40R18 (front) + P255/40R18 (rear) performance summer radials on 18” aluminum alloy wheels; Heated driver and front passenger seats with ventilation fans; Premium leather seat surfaces; Lexus driver and front passenger seat memory systems with three memory settings for each; Power moon roof; Bi-Xenon high intensity discharge (HID) headlamps; Lexus Adaptive Front Lighting System; Headlamp washers; Electrochromic side view mirrors; Rain-sensing wipers; Aluminum sport pedals with rubber inserts; Front illuminated “Lexus” scuff plates; Woodgrain trim; Power rear window sunshade; Bluetooth capability; DVD-based navigation system with back-up camera; Mark Levinson 5.1 channel audio system with in-dash six-disc DVD changer and 14 speakers. Features: Dual overhead cams; 24 valves; Dual Variable Valve Timing with intelligence (Dual VVT-i) on both intake and exhaust cams; Direct Injection System; Electronic Throttle Control System with intelligence (ETCS-i); Acoustic Control Induction System (ACIS). Features: Dual overhead cams; 24 valves; Dual Variable Valve Timing with intelligence (Dual VVT-i) on both intake and exhaust cams; Direct Injection System; Sequential multi-port electronic fuel injection; Electronic Throttle Control System with intelligence (ETCS-i); Acoustic Control Induction System (ACIS). Fuel efficiency: 11.6 L/100km city; 7.6 L/100km highway. Features: Overdrive; Sequential multi-mode shifter; Paddle shift. Fuel efficiency (IS250 RWD): 9.8 L/100km city; 6.7 L/100km highway. Fuel efficiency (IS250 AWD): 10.5 L/100km city; 7.6 L/100km highway. Fuel efficiency (IS350 RWD): 10.9 L/100km city; 7.8 L/100km highway. The Lexus Antilock Braking System (ABS) uses sensors to monitor speed, traction, vehicle load and the driver’s applied brake force. The ABS then controls brake applications to minimize wheel lock-up, reducing the chance of the vehicle skidding. The result is shorter stopping distances on wet, gravely, sandy or other surfaces where traction is questionable.